Sulpitac 50 (Amisulpride) belongs to a class of drugs called atypical antipsychotics, and it is used as a schizophrenia treatment. Some patients affected by bipolar disorder have taken this drug, and it has also been used as an antidepressant. Its effects when used to treat delirium have recently been studied. 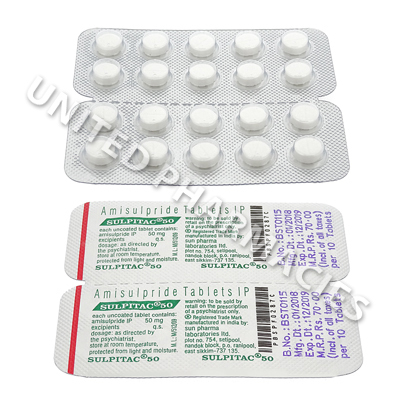 Sulpitac 50 (Amisulpride) belongs to a class of drugs called atypical antipsychotics, and it is used as a schizophrenia treatment. This drug acts on the brain, and affects a specific neurotransmitter (known as dopamine). It is a widely held belief that the symptoms of schizophrenia (such as hallucinations, hostile behaviour and social problems) are related to excess dopamine activity. Inhibiting the action of the dopamine receptors helps to control schizophrenia. Some patients affected by bipolar disorder have taken this drug, and it has also been used as an antidepressant. Its effects when used to treat delirium have recently been studied. All patients undergoing treatment with Sulpitac 50 (Amisulpride) must first visit their doctor for a medical consultation, so that the correct dosage can be prescribed. The dosage for can vary, and in some cases, adult patients have been told by their doctor to take a dosage that can range from 50mg per day to 800mg or more per day. In these cases, if the dose consisted of 300mg or less per day, a single dose was taken, whereas patients prescribed higher doses were given 2 divided doses. Patients suffering from certain medical conditions may need a lower dose, and in all cases, the exact amount prescribed by your doctor must be taken. All side effects should be reported to your doctor. In addition to the list of side effects given here, other reactions are possible. Patients should note that if any serious reactions occur, medical attention is required immediately. Patients affected by diabetes may need to have their sugar levels monitored during treatment, as there is a possibility that this drug will increase blood sugar levels. There is a possibility that this drug may cause serious side effects, such as neuroleptic malignant syndrome and tardive dyskinesia. Ask your doctor about the risk of this before starting treatment. 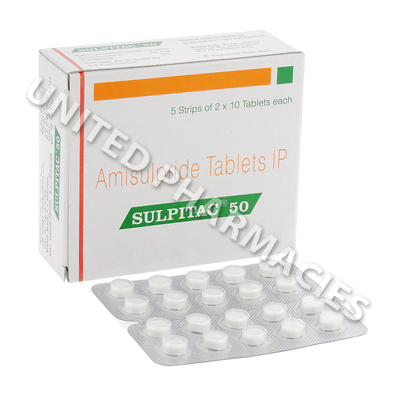 Always use Sulpitac 50 (Amisulpride) as you have been prescribed by your doctor. Never self-medicate or change your dosage without first consulting your doctor. The correct dosage can vary depending on your health, medical history, and the severity of the condition being treated.